Amalie Howard manages to take two elements we see used in hundreds of different ways across an enormous number of YA books and breathe such a fresh new life into them. She stayed true to the darker aspects of witches and vampires while adding her own original spin on the mythology. Rather than just imply that, 'yes, this vampire is good and does not kill, but still struggles to keep his fangs in place' she shows the conflicting emotions, the terrible all-consuming temptation and she allows her characters to falter. Both Christian and Victoria, while battling the darker urges within them both, are trying to gain control. But they aren't foolproof. They slip up. The darker side takes control sometimes. And I love that she doesn't gloss over the consequences. People die. Blood is shed. The flaws and mistakes are what make these characters 'human'. Relationships between witches and vampires has been forbidden for centuries. So they're also battling with the fact that they're basically starcrossed lovers, neither are permitted by the laws to come together in such a way. But how can you choose not to love someone? The blood pulsing through Victoria's veins - the one with dark, terrible urges. That fights for control. For sacrifice. For death - the one she calls the Cruentus Curse, is the very same blood that Christian's twin brother, Lucian is hunting. The vampires call the one with this blood Le Sang Noir. And Lucian wants her badly. Her abilities can give him the power and control he craves, not only over the vampires but possibly the witch clans too. But what he doesn't fully realise is the danger of this blood's temptation. Let's just say, that blood running through her veins? It's badass... in all kinds of horrific ways. I also have to make note of the setting. We not only see the US, but beautiful Paris too! Christian and Victoria both make a few trips (pretty easy to travel between continents when you're a vamp who can fly and a witch with the ability to teleport) to Paris to visit the vampire Council. It the media release I received for the book, it said that Amalie has visited 141 cities in 18 countries (WHOA! ), her travels definitely paid off because they give a great backdrop for the novel. There's also a ton of action and fight scenes to keep readers on their toes. It does not shy away from bloodlust and the violence that you would expect from a guy who craves blood or a girl harbouring a murderous curse within her veins. Bloodspell is everything you could ask for when two supernatural worlds collide together. Amalie explores the darker side of vampires and witches all while maintaining the bond between our two main characters and their struggle to make their love work. A unique and compelling mythology, deliciously forbidden romance, headstrong characters and a dark, haunting vibe that will keep you hooked until the very last page. I'm so happy this is only the first book in the series, I cannot wait to dive back into this world again! 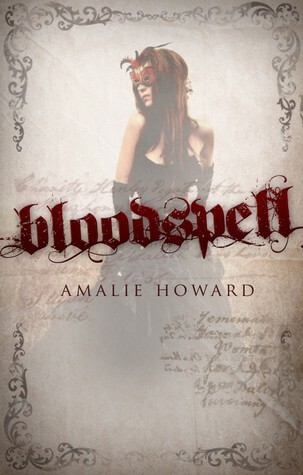 For those interested, Amalie has a giveaway up on her website to win a signed copy of Bloodspell. You just have to tweet about it to be entered! I highly recommend you do to win a copy of this fantastic novel! I love the sound of it! I wasn't so sure about it but you convinced with your great review. Looking forward to reading it. "They slip up. The darker side takes control sometimes. And I love that she doesn't gloss over the consequences. People die. Blood is shed. The flaws and mistakes are what make these characters 'human'." I agree with Natalie. There are so many amazing books coming out this year it's difficult sometimes to decide what to read, but your review definitely has me adding this to my list. Your description of the characters struggles, and how they are flawed but trying to be good really has me hooked! Wow! This one sounds fantastic. I hadn't really heard anything about it prior to this review so I will definitely be adding it to my list now! Omg!! This sounds amazing! You know I love vampire-witch novels! Bloodspell is everything I could ask for? Zomg. Zomg! 'A unique and compelling mythology, deliciously forbidden romance, headstrong characters and a dark, haunting vibe that will keep you hooked until the very last page. I'm so happy this is only the first book in the series, I cannot wait to dive back into this world again!' - this convinced me the most! I need to read this ASAP! Amazing review, Brodie! Now you know that my hands are itching to read this! Well...it's actually peering at me from my TBR pile. Armchair BEA Day 3: Meet Heather! Armchair BEA Day 2: Giveaways! Armchair BEA Day 1: Introductions! Love your Dystopians? Or Kelley Armstrong? Kryptonite has weakened me from reading!